My System Mechanic is the PUP that uses misleading techniques to prevent removal. Use Reimage to locate malicious components and get rid of them faster than with uninstall instructions. A full system scan blocks virus reappearance and prevents traffic to malicious domains. My System Mechanic - a fake system tool which bombards false alerts about various misleading computer infections and vulnerabilities. My System Mechanic is a fake system optimizer which has its official website. However, users often get tricked by advanced advertising techniques of the app, and some of them install it on their devices. Once established, My System Mechanic imitates a full system scan and bombards the computer screen with misleading alerts that announce about “numerous virus-related infections and vulnerabilities found.” However, all this activity is done to convince gullible users to purchase the key for the licensed version of this program. Pop-ups and other ads on Google Chrome, Internet Explorer, Mozilla Firefox, etc. promote My System Mechanic fake optimizer. Moreover, My System Mechanic virus marks various outdated registry entries and suggests that these tiny configuration files are somehow harmful to the PC. Some gullible users are threatened by such warnings and pay for the full program version which will “fix” all the issues. If you purchase the licensed variant, the program will initiate another fake scan, but this time will imply that all hazardous items were removed. However, this is just another trick used on people. Actually, My System Mechanic does not bring any true value and does not fix any system problems or gets rid of viruses. You can check your computer system by installing reliable security software and performing a full system scan with it. After that, compare the results with ones that were provided by My System Mechanic tool, if you are curious enough. You will see that there are almost no similarities to the fake alerts that you have faced due to the false system optimization program. Now you can be sure that there is nothing to be afraid of and you should perform the My System Mechanic removal using our instructions below. To bring your computer back to its previous state, scan it with Reimage. You need to remove My System Mechanic virus as it brings nothing but annoying pop-ups and fake alerts. There is no need of wasting your money for a useless program like this one. 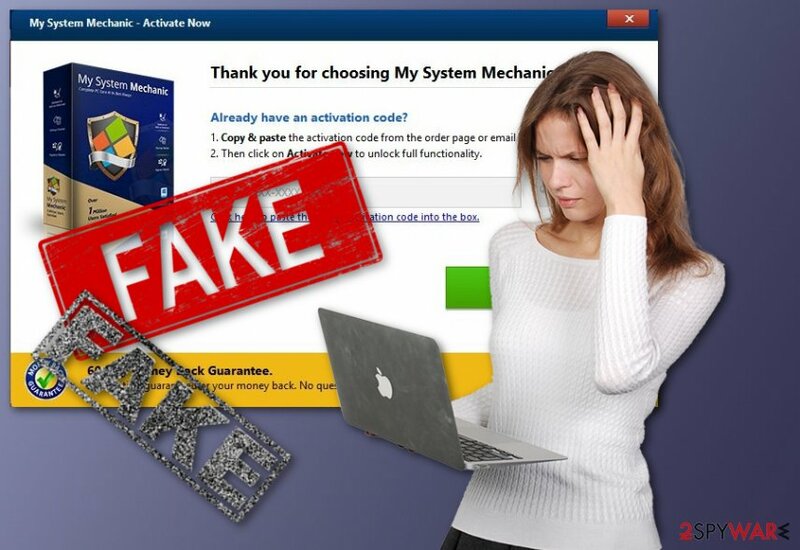 Be aware of bogus system optimizers next time, look through our given PUP avoiding methods and make sure that you do not fall for such sites like epcbooster.com which advertise fake fixing tools. 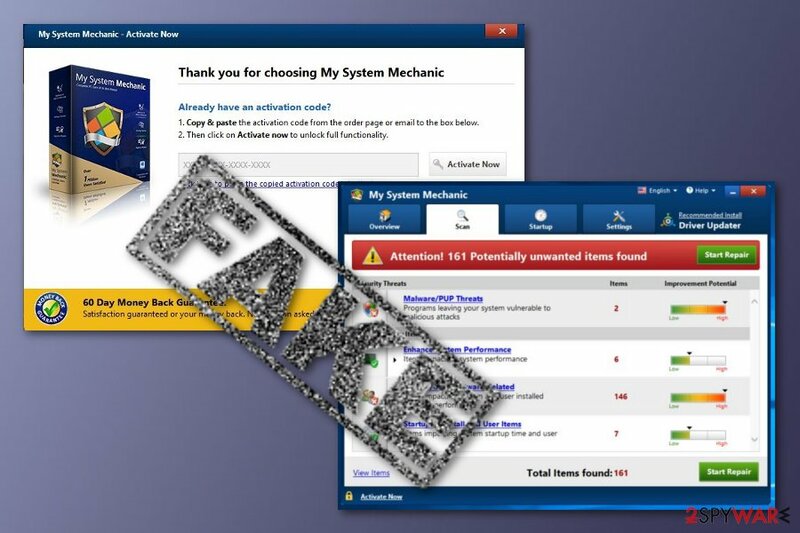 My System Mechanic - a fake system optimizer which can be downloaded from its original site or bundled with freeware. According to IT experts from Virusai.lt, various potentially unwanted programs such as fake system optimizers can be spread through their original web pages. Developers create websites that look attractive and convincing in order to make users install the unwanted application. However, be careful if you have entered such site, you will only face money losses while purchasing the fake system tool and it will bring no actual value for your computer, do not pay attention to what developers want you to believe. Moreover, unwanted programs can also be bundled with regular freeware or shareware. So, if you have found some rogue applications in your computer system, they might have silently sneaked in when you were downloading an app from the Internet. You should choose the Custom or Advanced installation mode to avoid such unwanted installations. Moreover, in this section, you will be able to track your downloads and opt-out the questionable-looking ones. You need to remove My System Mechanic virus as soon as you spot its fake alerts as it can not only swindle your money away but might even damage computer operation. For such purpose, you can use reliable anti-malware tools. This type of elimination will be much faster and effective as the antivirus tool will detect and delete all suspicious components at the same time. However, if you prefer performing the My System Mechanic removal manually, you can take a look at our provided instructions that can be found below this text. After you get rid of the cyber threat, make sure you remember to take all precautionary measures to avoid annoying PUP installation in the future and keep your PC and its components safe. Here, look for My System Mechanic or any other recently installed suspicious programs. When in the new window, check Delete personal settings and select Reset again to complete My System Mechanic removal. Once these steps are finished, My System Mechanic should be removed from your Microsoft Edge browser. Here, select My System Mechanic and other questionable plugins. Click Remove to delete these entries. Now you will see Reset Firefox to its default state message with Reset Firefox button. Click this button for several times and complete My System Mechanic removal. Here, select My System Mechanic and other malicious plugins and select trash icon to delete these entries. Click Reset to confirm this action and complete My System Mechanic removal. Here, select Extensions and look for My System Mechanic or other suspicious entries. Click on the Uninstall button to get rid each of them. Now you will see a detailed dialog window filled with reset options. All of those options are usually checked, but you can specify which of them you want to reset. Click the Reset button to complete My System Mechanic removal process. ^ Shareware. Techopedia. IT definitions. This entry was posted on 2019-04-01 at 13:02 and is filed under System tools, Viruses. You can quickly scan the QR code with your mobile device and have My System Mechanic manual removal instructions right in your pocket. How did you remove My System Mechanic?